The Music Note is after you, escape it ! Press the "Shift (Maj)" Button to jump and reach level 15 to escape it ! A Demonstration of a strategy platformer in developement. Click Challenge with a facebook community. As cubeOS 4 first version got released, you can still suggest your ideas and share them for future versions! cubeOS 4 is going very well and we made so much new things, we can release it even but we prefered to work more on it. You're highly encouraged to give your feedback and suggestions so we can improve it. Are you interested to submit your game for Cube OS? *Cube OS is a simulation of an Operating System in an executable file. It contains many apps such as : News, Today Quote and it has a Store where you can submit your game! *Cube OS is made with Clickteam Fusion 2.5.
cubeOS community · Created a new topic (January 2, 2019) cubeOS v4.0 is Released! You can update cubeOS directly from the Update Center, Press the "Home Button" in the mid-bottom of the Desk, on the right menu that appears, press "cubeOS Connect" and then Update Center. Enjoy! itch.io Community » Game Development » Help Wanted or Offered · Replied to siegex in Join our new indie Crew! itch.io Community » Game Development » Help Wanted or Offered · Created a new topic Join our new indie Crew! Collaborate with other teammates in order to know what is the best song that fits. We'll be proud of your paricipation on the Cube OS Store ! We are so sad to tell you that Cube OS is momentarily discontinued due to some server hosting issues. Actually, our free hosting site have changed their domain, we need to completely recode the Cube OS Files including all online features. As Cube OS is full of them it will take a lot of time to do so. 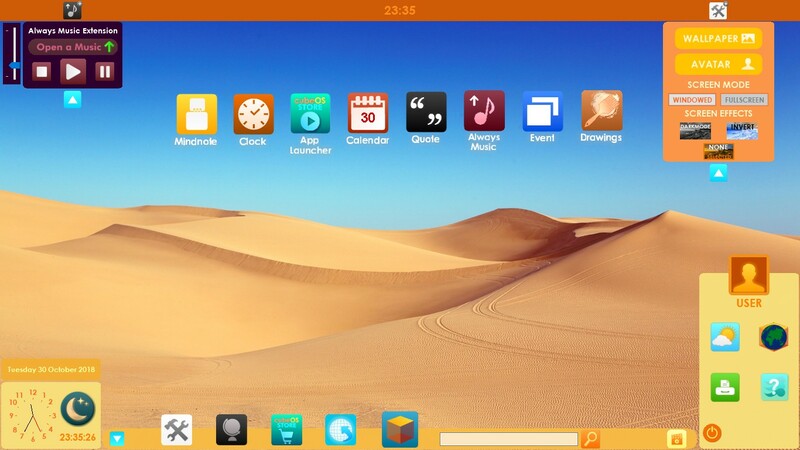 We are working on that, Cube OS Version 3 will be completely redesigned to offer you the best experience ever! See you soon! Cube OS Version 3.0 is Available to download here at itch.io and fixes servers hosting issues with ALOT of New Features :D See you soon ! cubeOS community · Replied to Snipper Joey in What Type of Music do you like to listen ? itch.io Community » Game Development » Help Wanted or Offered · Replied to shiva-23 in I need you to make my Game better ! itch.io Community » Game Development » Help Wanted or Offered · Created a new topic I need you to make my Game better ! I just want to do a little survey and make Cube OS's Music Library better, What's your favourite music ? cubeOS community · Created a new topic What Type of Music do you like to listen ? We need more information from you :) So we can add appropriate Music in the Always Music App's Music Library ! What do Type of Music do you enjoy listening to it ? itch.io Community » General » General Discussion · Posted in How can i make sure everyone with my game receives a patch when i make a new one? itch.io Community » General » General Discussion · Posted in Are most people here developers? itch.io Community » General » General Discussion · Posted in I Will Play All Your Games on YouTube ! Cube OS Developer Jam community · Replied to Guy_Who_Codes in 1 Day and some hours remaining ! Cube OS Developer Jam community · Created a new topic 1 Day and some hours remaining ! itch.io Community » General » General Discussion · Posted in New Game Jam ! The Jam will start tomorrow ! itch.io Community » General » General Discussion · Created a new topic New Game Jam ! The Cube OS Developer Jam has Started ! Create a game to have a chance your game will be featured on the Cube OS Store ! cubeOS community · Created a new topic We've Created the Cube OS Developer Jam ! We just made a new Jam ! The Cube OS Developer Jam where you are going to create an App/Game for the Cube OS Store ! First 3 Winners will get their Game/App released on the Cube OS Store ! itch.io Community » General » General Discussion · Replied to Jezla in I Will Play All Your Games on YouTube ! I'm back, I'm now start making the gameplays keep subscribed !